In an age when media-savvy footballers too often speak in platitudes and cliches, it makes a refreshing change to interview Andy Williams. The Cobblers striker has found himself out of the team in recent weeks with manager Keith Curle opting for the pace and movement of Sam Hoskins instead. I love every single time I score – it’s the greatest feeling you can get. I cherish every one of those 130 goals and hopefully there’s still a lot more to come. A slight tweak to the system, going one up top against Tranmere, Lincoln and Crawley, has meant there’s no room to accommodate Williams, and even when Curle returned to a two-man front line at Stevenage on Saturday, it was Marvin Sordell, only back from injury, chosen to partner Hoskins in attack. But, for Williams, there’s no pretending to be OK with the situation. He’s a footballer and he wants to play. And at the age of 32, he wants to play more than ever. “It’s not about opportunities being deserved,” he said. “I think any footballer worth his salt would be disappointed not to get on the football pitch because that’s what we get paid to do, especially at 32. “I didn’t come here to warm the bench. I came here to achieve things for Northampton Town and it’s frustrating to watch it rather than being involved. You have to go back to over a month ago, at Cambridge United on January 19, for Williams’ last start for the Cobblers. In the six games they’ve had since, he’s played a total of just 85 minutes. “I heard someone say the other day I haven’t scored in 2019 but how many starts have I had? You can read stats however you want,” he added. Williams again had to make do with a place on the bench for Saturday’s trip to Stevenage, but sent on with 20 minutes to go, he was not about to waste this opportunity to send a message to his manager. With the teams locked at one apiece as the game ticked into stoppage-time, Williams stood in for Ricky Holmes and played the role of Town’s last-gasp hero at the Lamex Stadium to perfection. Chasing David Buchanan’s hopeful long ball, his determination out-battled two defenders and his composure deceived goalkeeper Paul Farman, with his lovely deft finish dramatically grabbing all three points for the Cobblers. Players often talk about putting the team’s interests over personal landmarks, but whilst that’s also the case with Williams, him scoring goals can only be a good thing for the Cobblers. Now eight for the season and 130 in his career, he makes no secret of his desire to end the campaign as top scorer. “It’s always in my mind because I’ve achieved it at every club I’ve been at bar one,” he admitted. 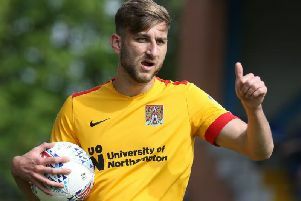 “I don’t want to finish my time at the Cobblers without ending as top goalscorer for at least one season. “It’s a long way to go until I achieve that. I’m not even in double figures yet and that’s disappointing for myself personally, but I think I have eight goals in about 17, 18 starts which isn’t the worst return in the world. Williams’ stoppage-time winner at Stevenage moved the Cobblers 12 points clear of danger and within six of League Two’s top 10. With a favourable run of fixtures to come, there’s every opportunity for Curle’s men to finish the campaign positively and build momentum towards next season. “Obviously you want to be positive and look up the table rather than down it but until you’re mathematically safe you don’t want to say anything because you never know in football,” Williams added. While for many the jury remains out on Curle, he deserves credit for steering his side away from the choppy waters of relegation and into the calmness of mid-table. It was not what many expected or hoped for at the start of the season, as Williams admits, but given the mess Curle inherited, it’ll do for now. “Obviously, it’s not where we wanted to be at the start of the season, certainly for me personally,” conceded the striker. “But I think the key for us is consistency. We’ve shown in patches throughout the season what we can do.